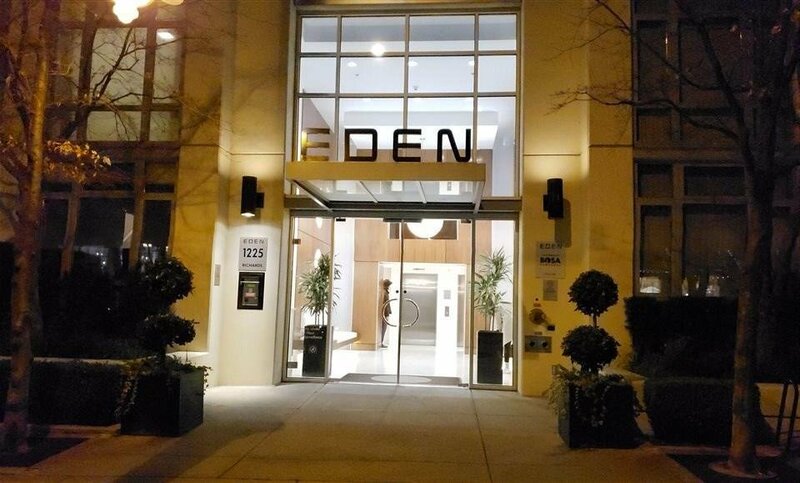 Contemporary style one bedroom plus den at Bosa's very own Eden. Built with pride, this unit features in suite laundry with an excellent floor plan. Fantastic balcony view. Unit comes with one parking stall and a spacious storage locker. Building amenities include steam room, whirlpool, gym, yoga room, bike room and guest suite. Steps away from Emery Barnes Park and Choices Market. Walking distance to coffee shops, restaurants, Art Gallery, Vancity Theatre and Sky Train . Recent upgrades include new floors and paint. This building is pet friendly and allows rentals. This cozy, well maintained condo is not to be missed.